Moondog, the happy go-lucky-lucky stoner poet at the heart of Harmony Korine's latest film, The Beach Bum, treats every day like he's at an all-you-can-eat buffet. With a PBR or a joint always in hand, one of the hardest and happiest partiers ever to grace the beaches of Miami and Key West seems to be in a perpetual state of bliss. There’s rarely a sober or dull moment in the life of Moondog (played by Matthew McConaughey), who’s a bit like a verbose and eloquent Jeff Spicoli -- or maybe a version of Wooderson -- all grown up. Moondog’s strange comedic odyssey is mostly full of joy, which was exactly what Harmony Korine wanted to express in The Beach Bum. After making a splash in the film world at age 22 thanks to his script for the relentlessly bleak Kids (written when he was 18), Korine alienated critics and audiences alike with bizarre and challenging work such as Gummo and Julien Donkey-Boy. The Beach Bum, then, represents something of a departure for the director: It's his most crowd-pleasing movie yet, packed with laughs, sun-drenched images, and an almost heartwarming attitude toward life. The imaginative take on the stoner comedy turns out to be yet another unique vision from the artist behind Mr. Lonely and Spring Breakers. Korine, over the phone, is fairly open about his process and has a good sense of humor about both himself and his work, though he does have a tendency to stop himself mid-sentence and shift thoughts completely. He knows how to give an unpredictable and original answer, too, an ability on full display even as he wrapped up the interview. Thrillist: Where did Moondog come from? How did you first imagine him? Harmony Korine: Moondog is... a lot of it was from spending time in Key West, and I lived in South Florida, lived in Miami, so I spent a lot of time in the Keys. A lot of it was just kind of a Keys vibe, or it's a real heartbeat that's present there. Guys that like to... I call it the kind of "check out" culture of people who celebrate this idea of complete and total lack of ambition, which I really admire, and I think is kind of hilarious. People go to the southernmost tip of the United States and run off. I have friends living on houseboats who just devote their lives to getting blazed all day and sitting up on that thing and they're staring at the sunset, fishing. Nobody wears shoes. People have pet chickens and drink a lot of red wine. It seemed like a fun world for me, and I like the idea of a character who lived there, embodied it. It's really just essential that if something feels good. [It's an] "if one joint is good, why not smoke 10?" kind of philosophy, and I grew up on Cheech and Chong movies and this idea of a cosmic America. Whether it exists or not, I'm not sure, but I've wanted to create a specific cosmic America for Moondog to dance around. You were very immersed in this culture and the life in the Keys, but how'd you get Matthew McConaughey plugged into this character and the environment? 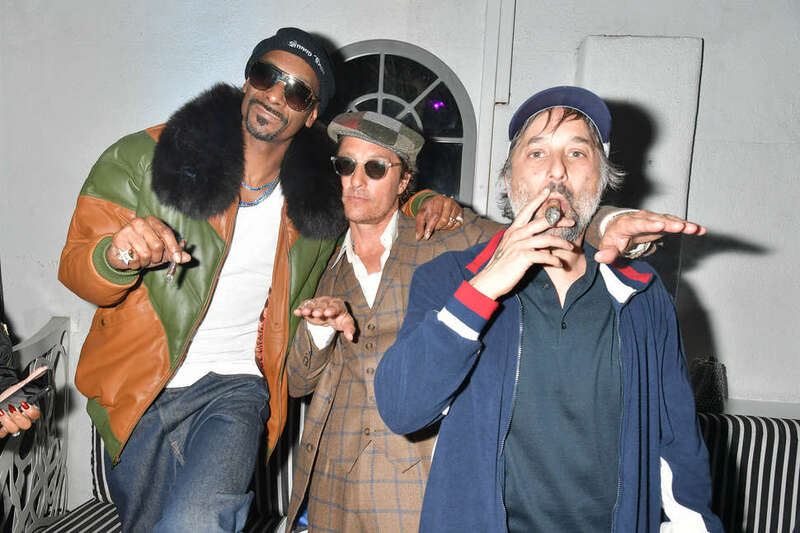 Korine: As cool as Matthew is, he's kind of already got this iconic stoner persona, and obviously he knows the world, and so it was pretty... I read him the character, and the first time I talked to him about it, it was obvious that he had known guys like that, so it was pretty easy for him to tap into it. He's known pirates, smugglers and that whole thing, and so I feel like he was already familiar with it. And then, he came down and we spent a lot of time just hanging out in the Keys. Did you write the script with him in mind? Korine: As I was writing and it was starting to develop and I was like, "Who could play this?" And then I liked the idea that he already had this persona, this thing people perceive. Even though it's not necessarily true, it still existed, so I forced it. I liked the idea of pushing it into something hyper-imaginative, hyper-real. You call that lifestyle a lack of ambition, but with Moondog, it also looks like personal freedom, similar to a theme in Spring Breakers. To you, is The Beach Bum about freedom? Korine: Definitely, that's what Beach Bum is about. It really is about the idea of freedom in the moment, living in the moment and an idea of, at least his character, even though there's kind of moral ambiguity, it really is about seizing a kind of joy and living without formal restraints. Obviously you can't be high for eight weeks. His character, there's something beautiful to watch the idea of his character -- whether he has money and he's living in mansions with a wife, or he's passed out under bridges, he's always himself. He's always at ease with himself, and he's always trying to find the poetry of life. When he talks to that reporter about life and says, "We're meant to have fun here," it's so simple but a surprisingly inspiring outlook. Korine: Because it seems like the world got so tight and there's so much constraint and everything is... there's so much menace, and it's just nice to hear someone, or for me to watch them, not in that. He's just going for it. When you were filming, what kind of environment did you want to create for Matthew McConaughey? Korine: His character's always high, and so it was kind of interesting 'cause obviously you can't be high for eight weeks. I mean you can, but you can't work that way, so I just tried to create an environment for him with music and characters and locations and things where life felt like a party. So it wasn't hard for him to step in and out, 'cause even when we weren't shooting, it was still kind of on the peripheral, so he always kind of was like blazed in some way, figuratively. What music were you playing on set? 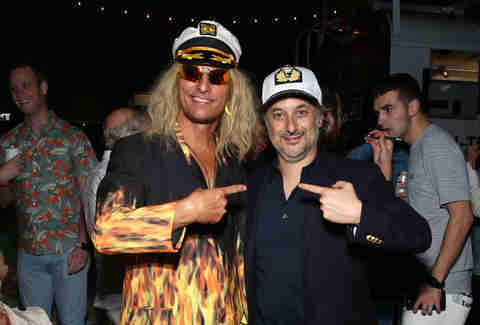 Korine: Mostly just yacht rock. Doobie Brothers, Christopher Cross. Al Stewart, Jimmy Buffett, classic yacht rock. Speaking of Jimmy Buffett, the sight of him and Snoop Dogg singing together has a kind of magical feel to it. What was it like filming that? Korine: That was the best. They really vibed. I always kind of weirdly saw them as almost flipsides of the same coin. They're so much alike in what they do and their own specific stoner mythology. They both create this kind of, with their music and their persona, this dream myth. It's almost this idea of a kind of cosmic America, this stoned, blazed identity. I feel like they were in some ways really culturally connected. It was fun to watch them. I think they really liked each other. One of the first stories to come out about the movie was you were planning to do smell-o-vision, having weed smoke pumped into theaters. Is that still happening, or was that a rumor? Korine: We have I think 10 theaters now committed. We're trying to figure out the ventilation system. Obviously, it's in places where weed is legal, but yeah, they're going to try to pump weed smoke and incense into the audience for the whole thing, and to... they're going to have these completely baked viewings. You've talked before about wanting to make these liquid narratives, almost sort of pop poems. Visually, how do you achieve that energy and feel in Miami? Korine: Yeah, it's the locations, and there's obviously locations I like. I just love the way it looks and feels, and obviously I want to have... it goes back even to the idea of doing screenings where everyone's stoned. I kind of want you to feel like you're in the world, like you can smell it. You can taste it. I don't follow a real traditional way of shooting. There's no real continuity, and I shoot a lot of the sequences in separate locations. It's more like a liquid narrative that has to do more with energy rather than following any kind of rules. It's more about seizing an energy, creating an energy. I'm sure there are like a million examples, but can you think of any instances of spontaneity on set that had that energy? Korine: Oh man, so much of them. Him and Martin Lawrence, the way they would interact, and Martin Lawrence's whole thing about having Vietnam flashbacks but never actually going to Vietnam. Having shrapnel blow off his balls and walking with a limp and having a cocaine addicted parrot. All these things just started to develop. Moondog and Captain Wack's dolphin tour was the hardest I had laughed in a long time. Korine: That might be one of my favorite sequences. I even think a whole Captain Wack movie would be about the world's worst dolphin tour guide who thinks sharks are dolphins. There's a Creed song in the movie. Are you a fan of "Can You Take Me Higher?" Korine: Yeah, I don't know. It felt like that was the song that Flicker (Zac Efron) would be obsessed with. You know, it just felt like that would be like Flicker's kind of mood music. For Moondog's poetry, were you always writing new poetry and new lines to try while filming? What were some of his more memorable lines or moments that were cut? Korine: Oh yeah, there's so many sequences. I had this great scene where he buys a sheet of acid from this kid, and he just gets on one of those motorized scooters and he's eating lobster and stone crab with a bib and he's going around in circles, singing. It was so good, I just couldn't... it was almost its own thing. I couldn't figure how to put it in the movie. There's a bunch of stuff like that. How long was your first cut of the movie? Korine: Probably like two hours. I'm a pretty vicious editor. Maybe it was like 2:20 or something. I would watch three hours of Moondog. Korine: Yeah man, I'm the same way. I mean, I wish in some ways I could do... I don't know how tolerant people are, but yeah, wish I could in some ways just do a... it gets even more debauched. Do you usually like to release deleted scenes? Would you for The Beach Bum? Korine: I was just talking about that with somebody, but it's like, I have so many. They're hilarious to watch on their own. But I don't know, do people actually buy DVDs any more? I don't even know. Is there like a still place where people can watch special features? I mean, maybe on YouTube you can put the scenes out. Moondog as an artist, is there anything about him you relate to or find inspiring? Korine: Mostly his life is so different to mine, but I like the fact that he always is trying to find joy. Like he says, he feels like the world is conspiring to make him happy. I think there's something beautiful about that. I think in the end, maybe that's all we have. When do you feel most joyful when you're working? Korine: It's just when it all comes together. Actually, the most joy I get on a film is when something leaves the page, when it goes to a place that I hadn't dreamed it would go, you know. Like when everything just coalesces in some way and the sky is beautiful and the camera moves in some beautiful way, and everything just clicks. That's why I work so hard just to get these moments that are fleeting. That's what makes it worth it. Before The Beach Bum, you were going to make a movie with Benicio Del Toro and Al Pacino. Is that a project you'd ever want to return to and make? Korine: I might do that next. I'm trying to figure it out, you know. After this comes out, I'm going to take a little time and just think about what to do, but it was a movie called The Trap, and we were almost at work on it for two years. We were probably a month out. The cast is really big and totally different. It was kind of like a revenge film, ultra violent, super intense and menacing. It dealt with the rap world in Miami. I spent six months storyboarding the film, and then there was an issue with one of the actors and scheduling and everyone's schedules got messed up, and so they wanted to push it back a year, and I just couldn't do it. At that point, I wanted to make something funny, and so it's something I might actually come back to next. Since you've explored poets, celebrity impersonators, and will maybe depict rappers next, are there any other worlds or occupations you'd want to make a movie about one day? Korine: Yeah, I love mowing grass, so when I was a kid, my first job I would mow all my neighbor's grass, and I was really good at it. I could get right up on the edge, and then one day bark got caught in the propellor. It smacked me in the middle of my forehead and I stopped mowing yards, but I always feel like it's something I want to go back to and see if I can master.